This past Tuesday we looked at a selection from St. Gregory of Nyssa‘s Life Of Moses (that found in Devotional Classics , Richard Foster & James Bryan Smith, eds.). The passage dealt with the pursuit of virtue, the entire theme of the Life of Moses. Perfection in St. Gregory is endless. Following in the Platonic tradition, Gregory argues that evil is essentially non-being. Evil is a lack, the absence of the good. The good, on the other hand, when there is no evil, is boundless. Goodness is never-ending; so also must be the pursuit of it, and that pursuit is virtue. This line of reasoning also takes Gregory to the doctrine of divine infinity during this passage. God himself is the ultimate good, the highest good, the most perfect being there is. Therefore, he must be infinite, boundless. He has no boundaries upon himself, his being, his action. According to Anthony Meredith in The Cappadocians , this doctrine of divine infinity is a new direction in theology and philosophy. 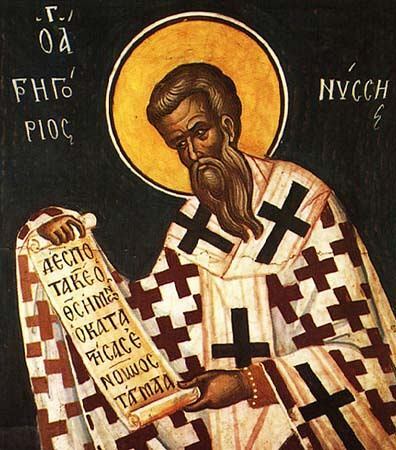 St. Gregory has innovated in both the Patristic Greek tradition as well as in his Origenist/Platonic context. If so, like most of the innovations within Meredith’s book, this has a great impact upon the subsequent tradition as well as being dictated by Scripture and tradition. Back to our own pursuit of perfection. I agree with St. Gregory. If God is perfect, and God is infinite, then the road to perfection must also be infinite. Thus, St. Gregory says, “For the perfection of human nature consists perhaps in its very growth in goodness.” I believe that this would accord with John Wesley’s idea of Christian Perfection as seen in his Plain Account thereof (for more on Wesley’s teachings on the topic, see the blog A Heart That Burns). We are not to lose hope, however. Gregory draws our attention to the heroes of the faith, to the people who populate the Bible, especially Abraham and Sarah. Of course, the main thrust of his work is the life of Moses and how Moses’ life is a model for our faith, especially when seen “spiritually”, ie. allegorically. In our discussion afterward, Liam suggested that perhaps the best thing to do in our journey towards perfection, towards “friendship” with God (St. Gregory of Nyssa’s word, not mine), is to start with regular prayer and Bible-reading. I know, I know. It’s grade three at Sunday School again. It’s every Evangelical preacher you’ve ever met. Well, guess what. And St. Gregory would recommend it, too. The Bible is where we find the lives of the Old and New Testament saints, where we find the teachings of who God is. And prayer is where we approach the Uncreated Light and enter into the darkness that surrounds His radiance. Would that we all prayed and read our Bibles! Where do you think we should go from there as we seek perfection and cultivate friendship with God?